EPOXO 88 is a versatile epoxy compound with the following characteristics: Rapid cure in any film thickness. Sets in 6 minutes after mixing. 1,500 lbs tensile strength developed in 15 minutes. Strong adhesion to practically any material - fiberglass, foam, aluminum, wood, plastics, etc. May be used as either a filler or a glue. May be sanded and feather-edged in 45 minutes. Has negligible shrinkage. 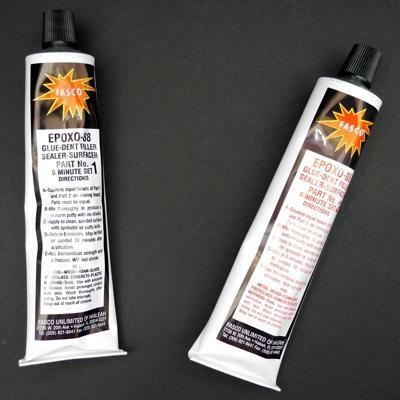 EPOXO 88 is a two-component paste epoxy with equal parts packaged in separate tubes. An equal amount of each part is mixed together on a smooth surface until a uniform color results. The paste may then be applied to the desired surface. Approximately 6 minutes after mixing, the epoxy will begin to set. Although primarily designed for industrial use, many modelers have discovered this great adhesive! 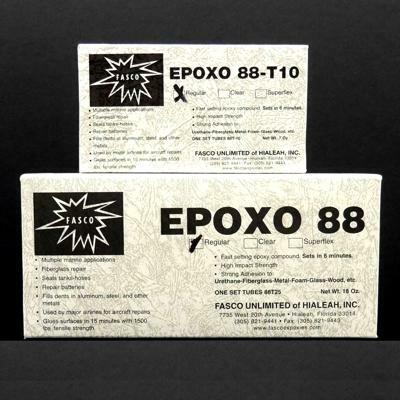 EPOXO 88 is an ideal glue for building most mid to high-power rockets. Unlike many other quick-curing epoxies, EPOXO 88 is not rubbery or overly flexible after curing. It makes great fillets! If weight is not an issue, it is also great for building smaller size rockets as well. For quick building, strong rockets, be sure to try EPOXO 88! Comes in 7 and 18 oz sets. Long shelf life, unopened up to 5 years. We've had tubes opened for well over a year that still perform fine!